In an emotional night where graduating players Keisha Brown and Anna von Maltzahn were honoured, the pair set the Dalplex on fire one last time. 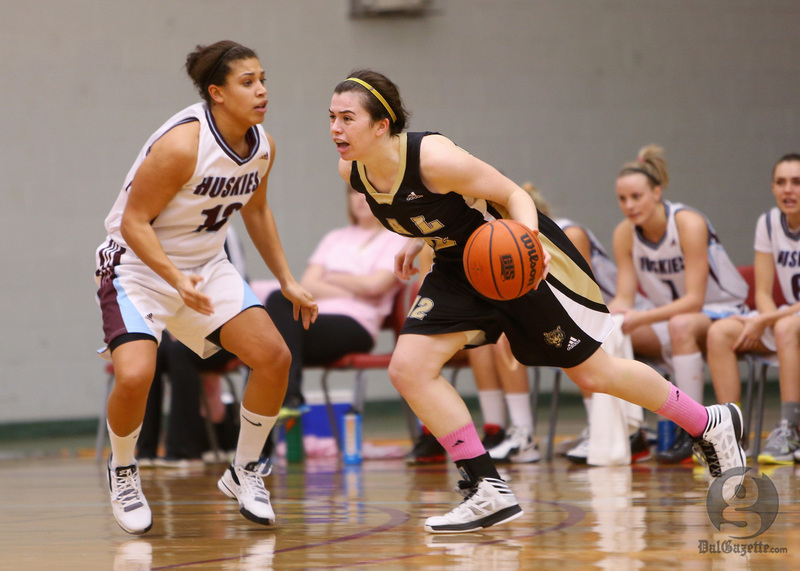 Dalhousie ended their season on a winning note by toppling the reigning champion Acadia Axewomen 88-78 Feb. 23 in a four-point game that featured numerous lead changes and strong performances from both teams. With the playoff picture already set, Dal fended off a late Axewomen charge to end their season with a 10-10 record, while the loss drops Acadia to 14-6. The AUS championship begins Mar. 8 in Fredericton. The fourth-ranked Tigers will face fifth-place Memorial in the quarter-finals, and the third-ranked Axewomen take on the host and sixth-seeded UNB. In what was a fitting reflection of their four years with the Tigers, von Maltzahn and Brown led the way for Dal by contributing 27 and 22 points, respectively. Kristy Moore had a game-high 30 points for the Axewomen. For the Tigers, losers of seven of their last eight games heading into Saturday’s contest, the win provides some much-needed positive energy entering their first round matchup..
To make noise in the playoffs, the Tigers will have to wipe the slate clean and forget about their late-season losing skid. But if Saturday’s game was any indication, von Maltzahn and Brown are not ready to finish their AUS careers just yet. The Dalhousie men’s basketball Tigers are continuing to put the AUS on notice. To say they have had a dramatic turnaround since the New Year would be an understatement. In their final regular season matchup the Tigers kept on rolling, dispatching Acadia 78-70 Feb. 23 at the Dalplex. The win improves Dal’s record to 11-9 as the Axemen fall to 15-5. With a 9-4 record in 2013, the Tigers are red-hot heading into the playoffs, which get underway Mar. 1 at the Halifax Metro Centre. The Tigers distributed the ball well all night as four players finished the game with double digits in points. William Yengue had 17 points and 14 rebounds, while Simon Marr had 19 points and 12 rebounds of his own to pave the way for Dal. Owen Klassen had 24 points and eight rebounds for the Axemen in a losing effort. The fourth-ranked Tigers face fifth place St. Francis Xavier in the quarter-finals of the AUS championships. The Axemen, who clinched a bye into the semis, will play the winner of Saint Mary’s and UPEI. Top-seeded Cape Breton will take on the winner of Dal/St. FX in the other semifinal matchup. The Tigers are playing with a swagger that was missing earlier this season. Whether they can sustain their late success remains to be seen, but one thing is certain: head coach John Campbell will do everything in his power to make sure his 2013 squad shows up instead of the 2012 Dal team that recorded a 2-5 record.